Are you guys like, European or something? | Pasta & Co. I got this on my Facebook wall a couple of weeks ago – I am still laughing. It’s so true. 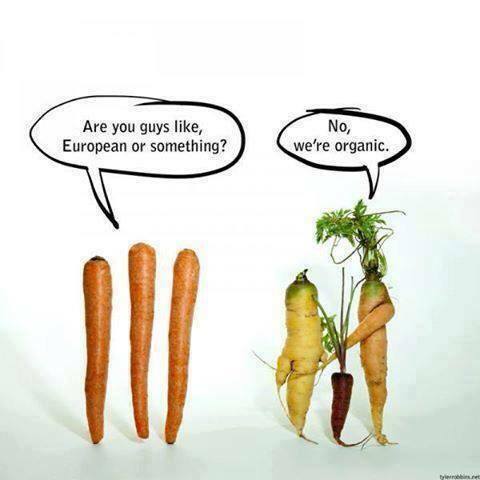 Organic veggies ARE different. As you know already, I signed up with a local farmer to get a weekly bag full of surprises. It’s been two months now and I am really enjoying. It keeps me trained and open to discover the local and exploring new flavors. In that bag I found the weirdest shapes of sweet potatoes, any size of pumpkin, green round squashes, long beans, potato greens, winged beans, jamaica flowers, grapes (muscadine), small sweet eggplants, spicy arugula, aji dulce, shishito, misome, okra, meyer lemons and more. If you live in Houston, check them out. They are at the Eastside Farmers Market on Saturdays. If you don’t, look for the closest Farmers’ Market and get a weekly share. It’s one of the best things that’s ever happened to me.